In Episode 3 Roger Sterling (John Slattery), becoming ever more frustrated with changing times, utters a phrase that will no doubt echo on the series - and off - for some time to come, "When is everything going to get back to normal?" Laurel Brown, senior writer at BuddyTV, contemplates the implications of Roger's question with Normal Isn't Coming Back. By far the most talked-about element of last week's episode was the revelation that beautiful Betty Hofstadt Draper Francis (January Jones) had gained more than a new home in recent months. This new twist in Betty's story arc created intense discussion, some controversy, and a variety of reactions. Jessica Grose presents her Defense of Betty Draper at New York (.com) magazine's Vulture. Bruce Handy of Vanity Fair considers Betty's dilemma from a different perspective by delving into The Amazing Junk Food of the '60's. 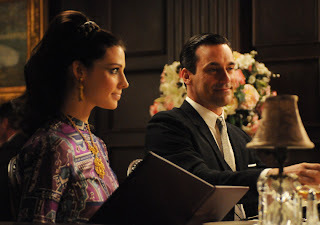 Not soon to be forgotten is that 5th Season opener moment when Don Draper's young and slender new wife, Megan (French-Canadian actress Jessica Paré), turned heads and inspired tongues to wag when she gave Don (Jon Hamm) a surprise 40th birthday party and a very special gift. Megan's rendition of the French pop tune "Zou Bisou Bisou" lit up the Twitterverse, and was the water cooler subject of the week. Leaving no stone unturned, Lauren Streib looks into the History of Zou Bisou Bisou for The Daily Beast. 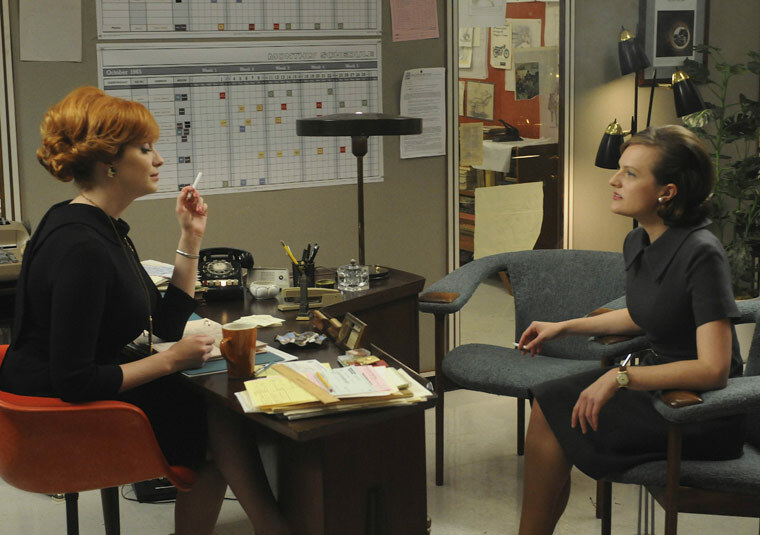 The Return of the Ladies of Mad Men is the focus of Alison Willmore at Indiewire, who views the series as one "about gender, about masculine ideals and shifting female identity." Eleanor Clift, a former Newsweek staffer (and sister-in-law of Montgomery Clift), recalls her memories as a woman in that news magazine's workplace during the '60s with Mad Men and Working Women (here, courtesy of The Daily Beast). 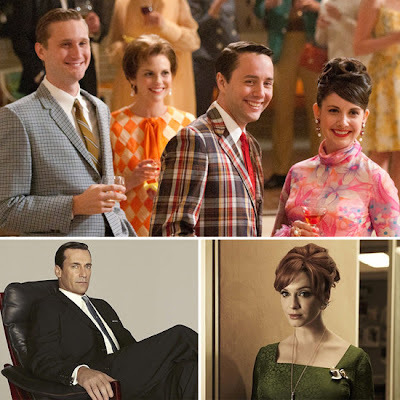 At the UK's Daily Mail, Kristie Lau contemplates How Mad Men Embraced the Fashion Trends of 1966, and at GQ, Matthew Sebra posts weekly on what the men of Mad Men are wearing, so far: Season 5/Style Report 1 and Season 5/Style Report 2. I look forward to reading "In Defense of Betty Draper". Last Sunday's Mad Men was quite an extreme turn on her character (but not really, if you think about the road she's traveled over the previous four seasons). Here are some words, courtesy of Jagger and Richards, that captured back in the 60's the plight of many women of Betty's generation. What a drag it is getting old. MCB - Betty seems well on her way to an Rx for "Mother's Little Helper" - at the very least. If only the Mad Men effects people could have also applied some acting ability make-up on January. The trials of Betty get more troubling, and I’m beginning to question Matt Weiner’s objectivity. 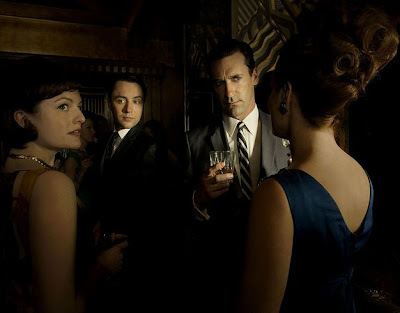 The past four seasons, “Mad Men” has excelled in authentic characters, believable melodrama and excellent storytelling. This season we have characters devolving into stereotypes and stock villains (yes, the characters reflect individuals of the period, but drama calls for an arc). I have been waiting for a plausible explanation for Betty’s behavior and unhappiness, and I thought they had found one in the thyroid. My parents have often repeated the anecdote of a young neighbor who displayed similar erratic behavior, until she was diagnosed with a tumor on her thyroid. Poor Betty, she doesn’t find any other answer but that she’s fat. Matt Weiner also gave us “a peek at his slip” by making a reference to a current presidential candidate (a bit of a reach blending historical fiction and personal politics). Ah well, I still can’t help myself, these characters fascinate me and I’m along for the ride, no matter how bumpy it might get. 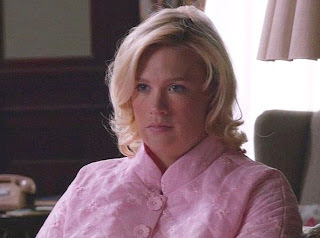 Dave - I haven't seen January Jones in anything but "Mad Men" and think she is perfect as Betty (Hofstadt Draper) Francis, a very depressed and repressed woman who's been expected to be nothing but pretty since childhood. Gypsy - We're having different reactions to this season's storylines and character development, it seems. Glad you're hanging in there, though...by the way, last episode's reference to "Romney" was George Romney, Mitt's father, who was governor of Michigan and who vied for the Republican presidential candidacy. I gotta put my two cents worth in on this one - I really think that January Jones is perfect as Betty. Sure, you don't see any Meryl Streep-like emoting or exotic accents that announce her performance as "great acting" but I feel she embodies that role and the repressed psychology of the Betty character and that she hits just the right subtle note - she's believable. The arts aren't something where you can measure quality objectively, like sports statistics (I think the Oscars is an example of just how hit and miss it is) but I personally feel that Jones captures the inner life of Betty. 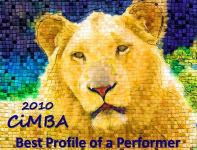 To me her character has traveled an almost predictable arc, including putting on weight. The thyroid problem would have been a neat way of explaining many things, but probably too neat. I'm not sure why Henry Francis would have considered George Romney "a clown", since Romney was a moderate republican like John Lindsay who Francis was working for. Given his track record for obsessive accuracy, I assume Matthew Weiner did some detailed thinking on this, but offhand I don't know what it would be. Eve and MCB, my comments were made in and with a spirit of irony. The show has always been a thoroughly enjoyable mix of nostalgia and provocative storytelling, and continues to excel in subtlety communicating the frenzied pace as which change took place (poor Roger). The first episode of the season made me laugh more than any other episode, and I, too, would have found the thyroid explanation a bit too easy, but a step in the right direction. Perhaps as Betty begins to shed the pounds; she'll shed whatever other defenses she holds equally closely as a form of camouflage. I also realize that the reference was to Mitt's father, however, in an election year it seemed too much of "a tweak" of the candidate's metaphorical nose. 'Gypsy - My guess would be that Weiner couldn't resist the "two Romneys" coincidence. But I do think Henry Francis might've made his snide crack about George out of loyalty to the NY GOP which was his bread and butter. 1968 should be an interesting year in the political life of Henry Francis. Yay! It's Sunday night! Is it 9 o'clock yet? I have to admit that I always feel like defending Betty Draper/January Jones against her critics. Poor Betty - she couldn't even have a private meeting with a shrink. I hope that this season lets her character evolve a bit. If I could write her progress, she would become a Jackie O-like editor (she is a college grad, after all - and she did meet her current husband by getting involved in community affairs). Don would be intrigued, but she will have outgrown him (not physically, though!). I just hope she & Sally can work it out. But, I think Matt Weiner is probably more creative than I am! Okay - the dark horse story is that Megan runs off with Harry.